Hi guys! Wow… what a day it has been. 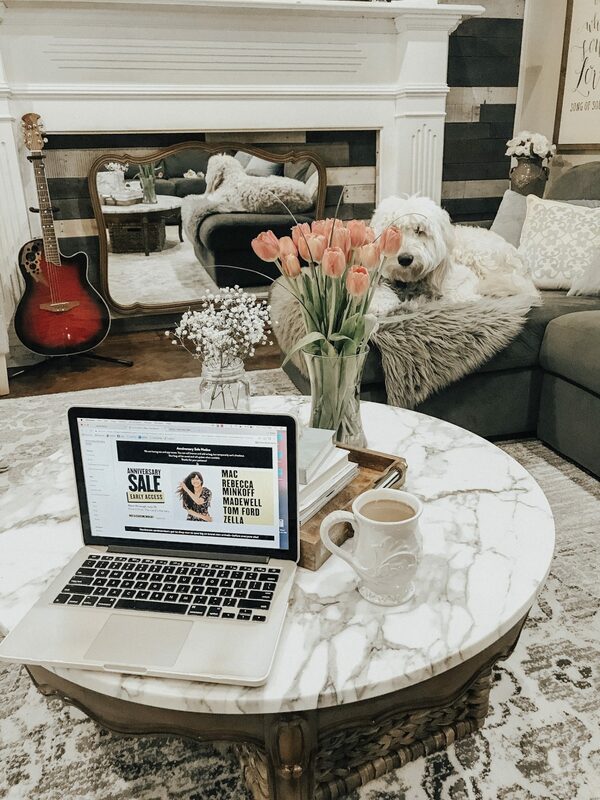 I woke up early and spent two straight hours linking items for you guys and finding THE BEST stuff from this crazy sale and I’m so excited to finally get this post up for y’all. In this post today I’ll be covering mostly clothes but I plan to do an entire shoe roundup and home decor post soon as well. Plus, stay tuned for some awesome giveaways so you can shop this sale guilt-free! Ha ha. Remember, you can only shop today if you’re a Nordstrom cardholder! If you want to apply for a card, do that here. If you want to wait, the sale opens to the public on July 20th. 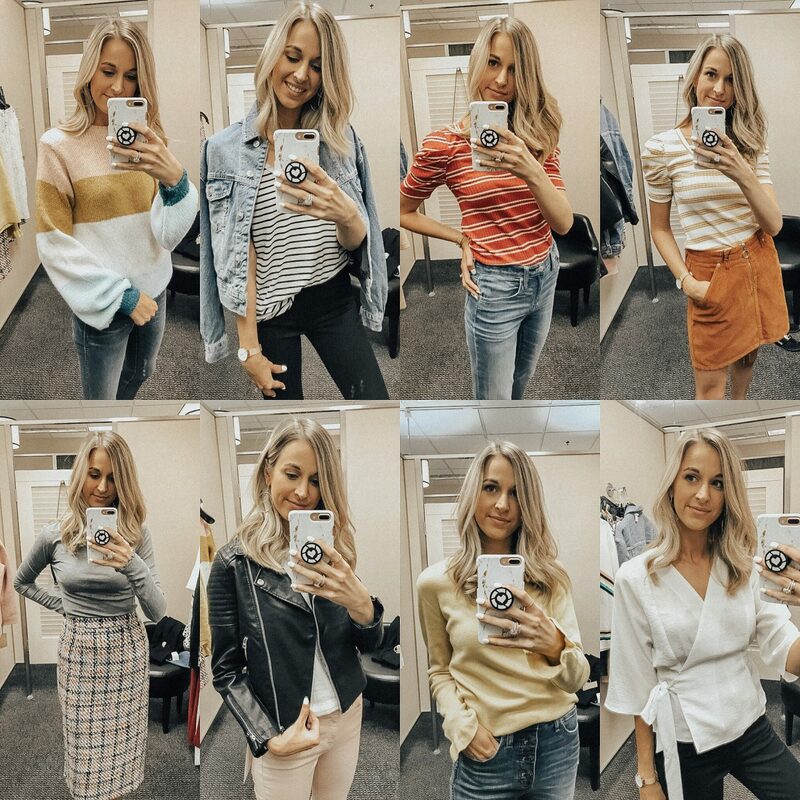 If you see something you like but it’s not in a color you’d prefer, be sure to click the link to see it on Nordstrom’s site because a lot of stuff comes in a ton of different colors! Things WILL sell out fast, so be sure to grab something if you really want it! $57! The quality is amazing and if I didn’t already own a great denim jacket I would buy this in a heartbeat! Bought these! 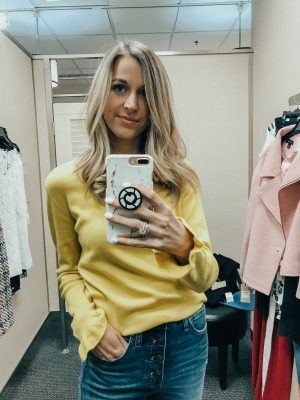 I was in desperate need of a great pair of black jeans and I loved these! This one came home with me because it was just sooo comfy and I was obsessed with these colors. The mustard with the blue is so gorgeous and I loved the trendy balloon sleeves. This was a size 6! These jeans are Madewell and they came home with me as well. I’m wearing a size 27 and they button all the way up in the front. See my instastories for a better view or click the link below! 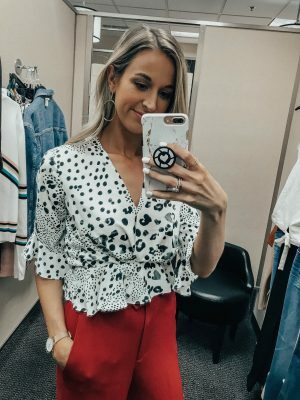 This top was so fun and it comes in a bunch of different colors (see next outfit). I love the ruching on the sleeves! I thought it was a nice touch to make this shirt a little more fun! Size small. Madewell jeans again, and these didn’t come home with me because they were a little big. These were a 26 but apparently they run a little large because I think I needed a 25! They didn’t have that size in store. I loved the hem of these though and I think I’d wear them a ton! Here is this top again but in a mustard color! Wearing a size small. 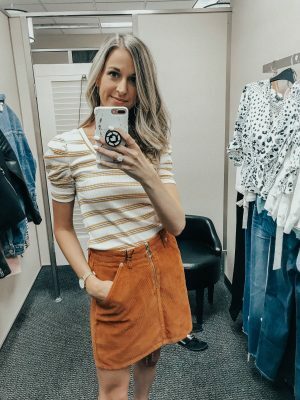 This faux suede skirt paired with this top makes for the perfect fall outfit! I loved this entire look and it would be so cute with a pair of booties! I’m wearing a size 6 but I would’ve sized down to a 4 if they had had it in stock! 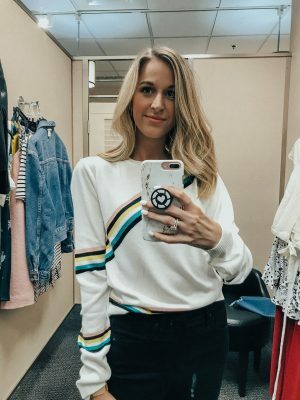 If you’re into colorful tops this one is so cute! I loved the rainbow stripes across the front and back and it’s another good one for fall in Texas because it’s thin! These are the same black Madewell jeans from the first outfit! Wearing a size 26. Probably one of the softest tops I tried on, omg. I wanted to take this home so bad and I still may because it was amazing. The sleeves are extra long and have a cute ruffle at the ends. I’m wearing a size medium and it was pretty fitted. 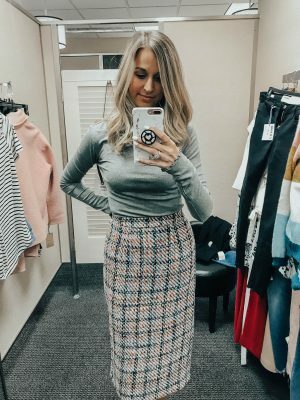 This tweed skirt was so classy and the pink and blue thread in it was just stunning! Wear this to work and be the best dressed in the office FOR SURE! Wearing a size 2 and it’s pretty long. I’m 5’9″ and it came down to my mid-shin. This jumpsuit was the only jumpsuit I tried on but I loved it! The material was really soft and it would be so cute with some black heels for date night! Click the link below to get a better picture. This is a size medium but I think I would’ve preferred a small! 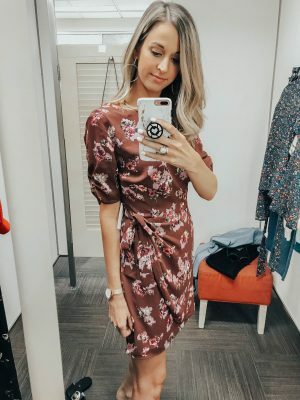 This ASTR the Label dress fit so well and would be so cute for the office! 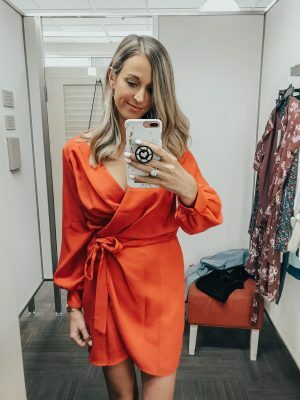 It has a faux wrap tie on the side and the color is so pretty for Fall! Wearing a size small. This sweater came home with me and it’s perfect for a Texas Fall because it’s very light. It comes in a couple different colors and would be really cute with shorts! 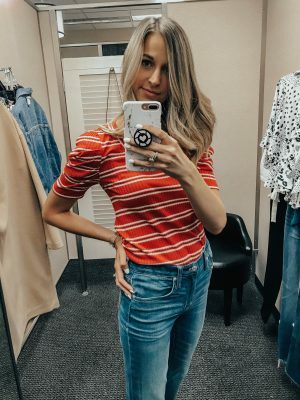 Madewell button up jeans! These are the same as the ones I linked with the striped sweater earlier. Size 27. 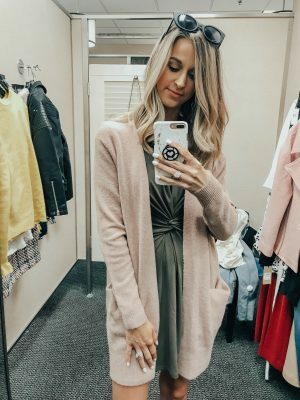 This cardigan comes in 3 different colors and it’s the softest cardigan that I tried on! This is a blush pink and it’s a size small! *The dress is not in the Nordstrom sale. This pretty thing came home with me as well! I was in need of a cute white sweater and I love the detail of this one. It’s sewn together at the cleavage so you don’t have to worry about it opening up. Score! Wearing a medium! 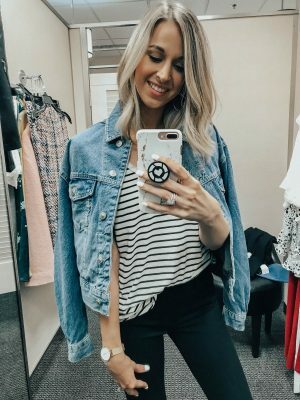 My go-to Madewell jeans again! OMG I loved this cute floral top! 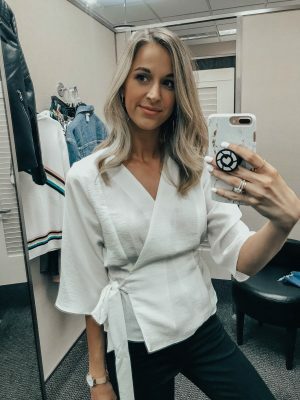 It has a cute tie on the side and bell sleeves! 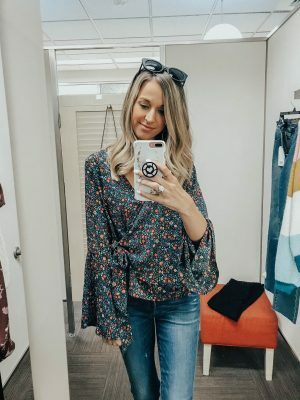 What more could you ask for in a Fall blouse?? Wearing a small. 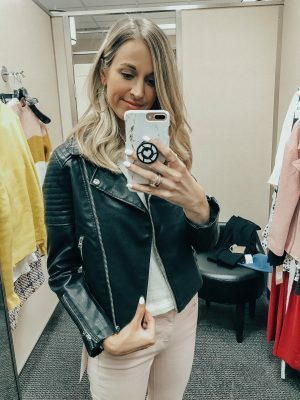 The Nordstrom sale always has a good faux leather jacket. I bought one last year in the sale and it will last me forever! I loved the detail on the sleeves of this one! Wearing a size small. 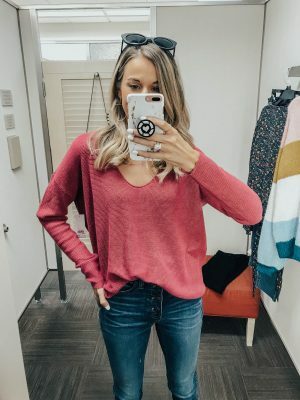 These jeans are light pink/blush and have a distressed hem. So dang cute! Size up if you get them! Ugh I wanted this shirt so bad but since I work from home I knew I wouldn’t get a ton of use from it. It comes in red as well and I’m wearing a size 4. Fits perfectly. These are the same black Madewell jeans from a previous look. Loved them so much I bought them! 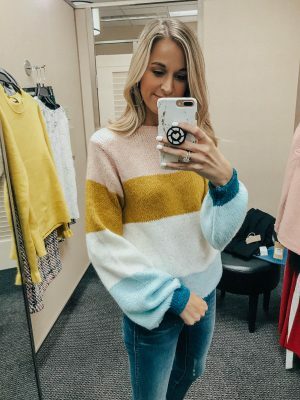 This lightweight sweater is so bright and fun. I loved the ruffle sleeves too! I’m wearing a size medium but would prefer a small or even xs. This red little number was HOTT. 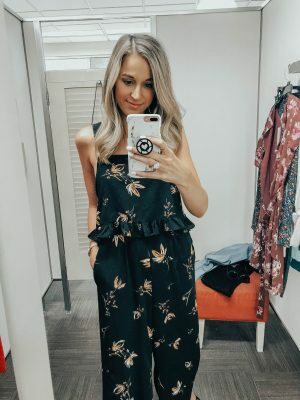 Perfect for date night and the sleeve are so pretty! It would be darling with some dangly earrings and some black heels. I’m wearing a size 4 for reference! My mother would love this blouse! I definitely sent it to her today. So cute for the office or going out! Pair it with a black pencil skirt or some black jeans and heels! Loved the material of these bright red trousers. I needed to size up to a 4 but if you’re tall you may pass on these because they were a little short for me. Great work piece though! Is it over?! Goodness, that was a lot of work you guys but I’m happy to do it if it helps you at all. The sale is super overwhelming (even for me) so I hope y’all enjoyed seeing/reading this post. If you have any questions about fit comment below! Stay tuned for a full shoe roundup and home decor roundup! PLUS a giveaway is coming soon! 🙂 Have a great night!